Cognitive scientists have long known that people are fairly resistant to seeing things they don’t expect. This is an excellent example of how focusing attention in one thing often leads to poor cognitive realisation. [Test subjects] consume what may or may not be alcohol. They are told what they are drinking, but sometimes they are told the truth and sometimes not. So really, nobody has a clue, except the bartender. Afterward, they are asked if they saw the gorilla. Only 18 percent of the people drinking alcohol noticed the gorilla, which is the point of the paper by Dr. Clifasefi and colleagues. But what caught my eye was that only 46 percent of the sober people saw the gorilla. Think about ethics here. Issues abound. The first is obvious and has been exploited by pickpockets and con-artists for centuries. When someone is distracted, you can do almost anything. Thus the person bumping into you on the subway or asking for directions on the street or simply stopping is an excellent way for people to steal you blind. Right before your eyes. This has led cognitive scientists to warn about how memories can be incorrect. If you add the idea that you can subsequently change what people remember (cognitive scientists stop at nothing to confuse people), then testimony in almost any trial becomes less convincing. This leads to juries placing more and more faith in a CSI kind of investigation. This adds uncertainty to uncertainty. Better lawyers know how to exploit this in a system that focuses not on fact finding, but on proving guilt or generating a reasonable amount of uncertainty. Finally, if you didn’t notice the colors changing for the card tricks, imagine how easy it is to move the intellectual goal posts on something you can’t even see. While America watched American Idol or 24, can you change something in the dialog; some moral compass heading? The survey, by an army mental health advisory team, sampled more than 1,700 soldiers and Marines between August and October 2006. It examined their views towards torture and the Iraqi civilian population. A Pentagon official said the survey had looked under every rock and what was found was not always easy to look at. Soldiers and Marines are fairly similar in their attitudes toward the treatment of non-combatants and insurgents. Only 47% of Soldiers and only 38% of Marines agreed that non-combatants should be treated with dignity and respect. Well over a third of Soldiers and Marines reported torture should be allowed, whether to save the life of a fellow Soldier or Marine(41% and 44%, respectively) or to obtain important information about insurgents(36% and 39% respectively). So while you were watching 24, the moral center of the American Military shifted. It changed to black. Did you notice the change? Were you paying attention or were YOU distracted? It’s as if the new OPSEC regulations I wrote about yesterday weren’t bad enough. Got all the bloggers mad. Now the army needed to go out and piss off the media. Why worry about the media? Because they are a threat! What, you don’t believe sweet, lil ‘ol’ me? Below is an image from page 5 of a wonderful little Army presentation found by Steven Aftergood at the Federation of American Scientists. Steve describes the new regulations this way. The terms of the Army regulation are so expansive as to create innumerable new opportunities for violations and infractions. Just this week, for example, the Army’s own 1st Information Operations Command ironically posted a briefing on “OPSEC in the Blogosphere” (pdf) marked For Official Use Only. See that pesky box lower, right? 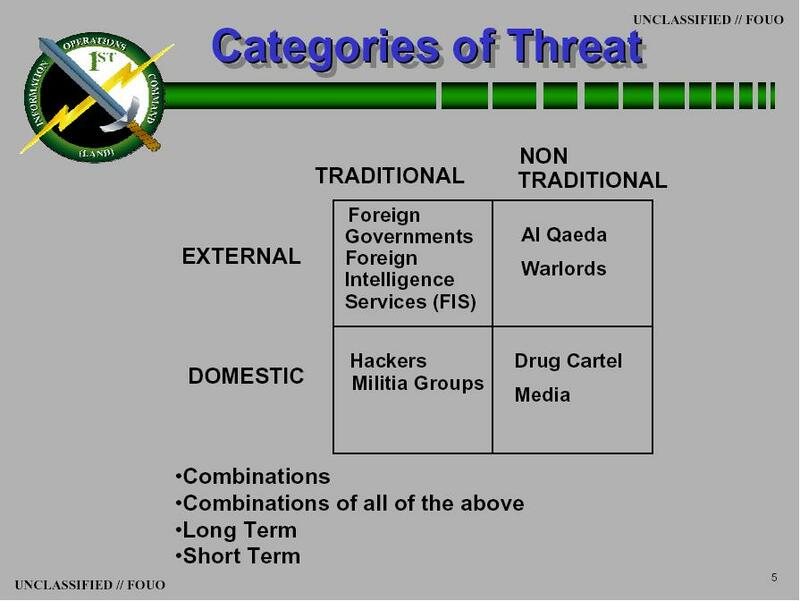 Under Non-Traditional Threat/Domestic…yeah, there under Drug Cartels? Oh! This is so going to tank. Bloggers are one thing but get the media riled up. Snigger. The only thing I find really surprising about the current curfuffle about Walter Reed is why the Amerian public seems happy with the current investigation. I watch congress persons pulling out newspaper article after newspaper article and pointing to official reports about the issue while the admittedly bad managers from the army were being grilled. And while I am at it, why exactly did it take that long to ‘break’ the story if the problems are so endemic? Didn’t anyone think to look until now? Oh. Right. The administration has a great track record with that honesty thing. But to assume that the Army even understands the issue? No. They don’t even see a problem. The following exchange related in Dana Milbank’s Washington Post column on Tuesday highlights the issue. Go back. Re-read the testimony from the new (and former) head at Walter Reed. He managed either a Bushism or a Freudian slip. He doesn’t want to solve the problems. He wants the cases to ‘disappear in the system.’ To bury the still living in paperwork while the dead are being interred at Arlington. And Kiley’s going to redouble his efforts to make it so. That is the problem. I guess it’s a question of perspective. You only see what’s wrong in hindsight.